This majestic Lake Sammamish residence represents the ultimate expression of sophisticated Northwest living. With 4,400 square feet of carefully designed and meticulously constructed living space arranged over two floors, the house combines the linearity and timeless classicism of Frank Lloyd Wright’s Prairie School of architecture with modern design, and state-of-the-art systems, to create a home that is at once elegant and stately, yet also relaxed and enveloping. Constructed as the personal residence of its original builder, the materials and finishes are elevated to the level of art. 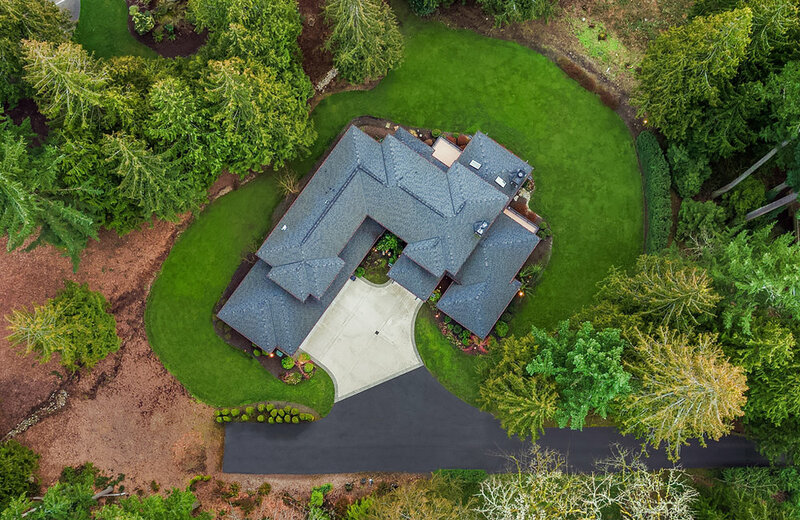 The house is sited on over 1.2 acres of elegantly landscaped property with a sweeping drive and forested backdrop at the end of a cul-de-sac to ensure privacy and utter tranquility with views over Lake Sammamish. It is an expansive design, with wide overhangs to provide shelter under its rooflines and visually extend the home’s overall sense of horizontal grace, while clerestory windows rim the structure from under the eaves in a nod to the Arts and Crafts and Prairie styles. The foundation is clad in a native stacked stone to anchor the home to its native surroundings, and entry is through a grand port cochere constructed of natural beamed truss-work. Siding is a combination of staggered clapboard on the main level, with board and baton above, while windows include horizontally divided lites. A deep three-car garage affords over 1000 square feet of vehicle storage and shop space. Inside, the two-story foyer opens into a great room that functions as the epicenter of the house. It is separated from the dining and kitchen areas by a divider that includes a custom-built sideboard and bar area that allows site lines through to the other side of the house. The dining room is a long and grand space, suitable for large gatherings, and the kitchen is comprised of a spacious cooking area, a huge island, and a sun-soaked breakfast nook that overlooks the back yard. On the other side of the great room lies the opulent master suite, which is its own wing of the house, accessed by a private hall off the entry. Following the floor plan around from the kitchen, there is a private home office, a powder room, a complete laundry room and a dedicated workout area off the hall that accesses the garage. Upstairs, three spacious bedrooms and a huge bonus room complete the layout. Two of the bedrooms share a Jack and Jill bath, each with private water closets, while the third is set up as an autonomous guest suite with ensuite bath. The bonus room contains a kitchen, media area and plenty of room for games and recreation. This is an exceptional residence, built by its original developer as his private home, and resplendent in meticulous craftsmanship and refined materials. With a timelessly elegant and crisply contemporary design, it can serve as backdrop to a wide range of personal tastes and collections, and offers an open, flowing floor plan that lends itself to comfortable daily living and extravagant entertaining, alike. Sited in a park-like, yet convenient setting, it is a masterpiece of thoughtful design and truly stands as a home without compromise. Entry to the home is through a pair of oversized glass doors that open graciously into the foyer and GREAT ROOM with 19 foot ceilings and over 400 square feet of casual living space. All hardwood floors on the main level are crafted from wide-plank tiger wood, and are complimented by gorgeous clear vertical grain fir millwork and built-ins. The great room offers a gas fireplace set into a granite mantle that is surrounded by custom built-ins and book cases for display and storage along one wall, with a huge granite-topped buffet on the opposite side of the room, complete with bar refrigeration, sink and plenty of storage space for glass and serving ware. The room overlooks a beautiful view corridor over Lake Sammamish, and French doors open out to a huge covered deck that is a virtual outdoor living room, featuring a massive fireplace, dedicated grilling area, skylights and red wood ceilings with recessed lighting and heat lamps for year-round comfort. The DINING ROOM is situated between the great room and kitchen for easy access and great flow. It is a wide and long space that welcomes large parties and intimate gatherings alike, with tremendous natural light welcomed by a wall of windows across the back of the house. The KITCHEN is a masterpiece of craftsmanship and high-performance design. It is organized around a huge cooking and storage island with a granite counter top, stainless sink and dishwasher, illuminated by pendant spotlights. All cabinetry is custom built from clear vertical grain fir to match the trim and built-ins throughout the house, and features an inset metal trim band along the upper perimeter and Brazilian slate and glass tile backsplashes to compliment Black Absolute slab granite counters. A Dacor six-burner gas range with double ovens is ventilated by a commercial hood and is served by an articulated pot filler faucet for convenience, while a 48” GE Monogram built-in refrigerator provides water and ice in its door. Just behind the kitchen, lies a dedicated and PRIVATE HOME OFFICE that includes a charming lake view. A LAUNDRY ROOM with a clothes chute from the second level, matching custom cabinets, stainless countertops and family cubby holes for organization sits between the office and workout room, while a large PANTRY provides easy storage for Costco-sized provisions. A WINE CELLAR, outfitted with custom red wood racking and slate floors provides climate-controlled space for individual bottles and cases, while an elegant POWDER ROOM with custom designer tile rounds out the main level public spaces. Behind the great room, resides an opulently scaled and luxuriously appointed MASTER SUITE, comprised of a spacious bedroom that opens onto its own private deck, a huge ensuite bath and a walk-in closet, all separated from the rest of the house by a private entry hall. The bedroom offers double coffered ceilings and relaxing views over the back yard and lake, while the bath is a grand, spa-like retreat that features two full-wall vanities, radiant floor heat, a private water closet, a two-person shower room with built-in seat and a deep hydrotherapy soaking tub set into a corner window. All Cabinets are custom-built from clear vertical grain fir, and are complimented by exotic slab granite counters with large-format limestone floors and glass backsplashes. The dressing room is outfitted with a custom-fit closet organizing system. A beautifully crafted wood and wrought iron staircase leads to the second level of the house, and to three additional bedrooms and a bonus area above the garage. Two of the AUXILLARY BEDROOMS overlook the back yard and share a Jack and Jill bath, each with its own water closet for privacy and convenience. The third upstairs bedroom is configured as a GUEST SUITE with ensuite continental bath. All cabinets are custom and run floor to ceiling to maximize storage, and counters are slab granite with designer backsplashes. Second floor ceilings are 9 feet with recessed ambient and task lighting. The BONUS ROOM affords over 400 square feet of elegantly finished space for recreation and media. It includes a dedicated kitchenette with custom cabinets and stainless counters, a dishwasher, beverage refrigeration, sink and microwave for effortless movie nights and relaxed afternoons watching the big game. There is also plenty of space for a pool table or other gaming options in this sumptuous and spacious enclave away from the rest of the house, and it is wired for surround sound and all state-of-the-art media options. Not only is this house a beautiful and lovingly crafted retreat, it is also a marvel of modern comfort and convenience technology, featuring state-of-the-art systems and construction practices to ensure years of carefree and secure living. Heating and cooling are provided by two furnaces, two central air conditioning units and two recirculating hot water systems with electronic air filtration and wiring for a backup generator, while a central security system monitors everything for safety and reassurance. There is an interior fire sprinkler system, as well as a central vacuum for quiet, high-powered cleaning. Programmable outdoor sprinklers allow for easy landscape care, exterior water features provide relaxing sounds and calming gazing opportunities, and low voltage lighting illuminates the gardens and exterior of the house for security and dramatic effect. All interior fixtures and hardware are of the highest quality, and there is extra sound insulation throughout the house to maintain peace and tranquility – even among busy families. CAT 5 wiring provides high-speed network access throughout the house. Finally, the house has been designed to be accessible for age-in-place living. The house is in perfect harmony with its property, maintaining a low profile that integrates it with surrounding nature, while opening a postcard view over Lake Sammamish that is delicately framed by old growth forest and carefully selected native plantings. This is truly a home for those who enjoy outdoor living with all the comforts, and the huge COVERED DECK off the great room offers every conceivable luxury, all artfully arranged under an expansive, clear red wood ceiling with outdoor speakers, built heaters and recessed lighting. 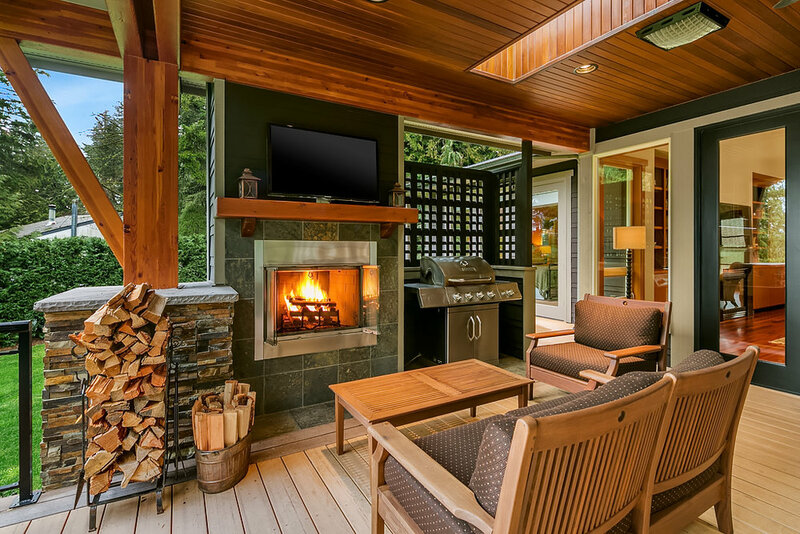 A gas-lit, wood-burning fireplace with wiring for a flat panel TV is the perfect outdoor gathering place, next to a grilling area with piped in gas. Additional, uncovered deck space surrounds the covered area for enjoying the sun on Spring and Summer days. Lake Sammamish is a beautiful community that runs along the perimeter of one of Washington’s largest and most picturesque lakes, offering unlimited options for outdoor and water-born enjoyment. Its inclusion in the celebrated Issaquah Public School system is a tremendous asset, as is its convenient proximity to the Eastside tech corridor and downtown Seattle. 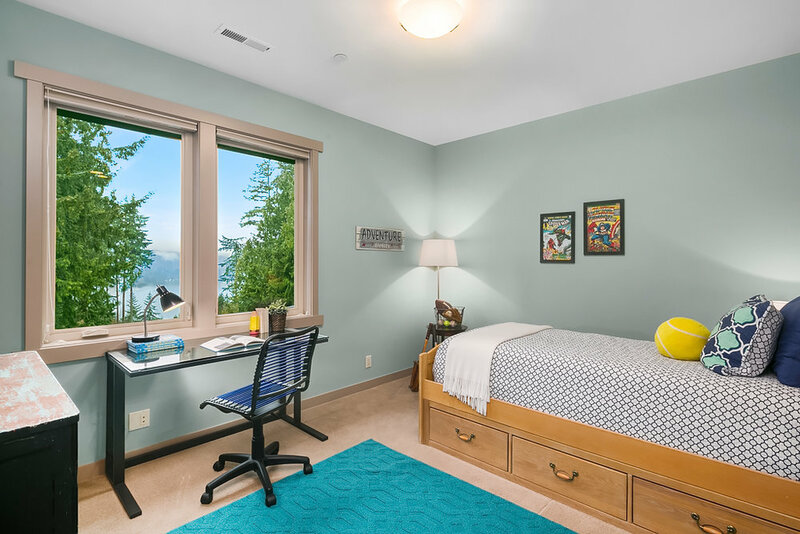 Lake Sammamish is the best of both worlds – connected living surrounded by year-round natural beauty and privacy.